The inaugural Atlanta Brunch Festival was substandard. Atlanta Beer Festival’s newest addition took place in Historic Fourth Ward Park, across the street from Ponce City Market. Tickets to the 21-plus event sold out quickly. 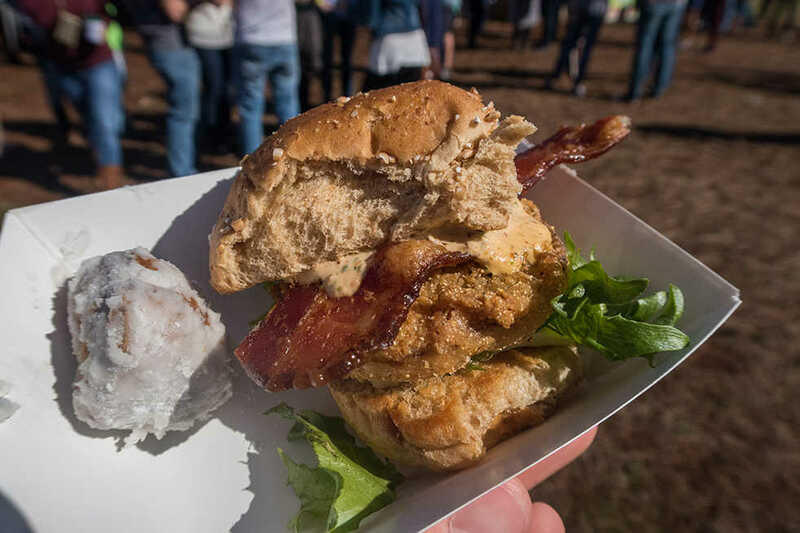 Near the entrance, there were 12 stands surrounding a muddy area, and these featured Another Broken Egg (Fried Green Tomato BLT) and Queen of Cream (mini Cowboy Bebop sandwiches) in addition to others. There were two rows of food trucks, including Nana G’s Chicken & Waffles, the Fry Guy, Meatballerz and Dominic’s NY Pizza. Several bars were placed near the stands, serving mimosas, Bloody Marys, wine and beer. The VIP tent was located in the middle of a large open area and served the same drinks and one food item. The event brought thousands of people and packed the venue, to their own detriment. The lines to the bars were so long that they did not move. Food lines were more respectable; however, food at many of the stands ran out hours before the event ended, and the event was only a few hours long. Not only was the event crowded, but also the layout of the event was crowded given the amount of space that Historic Fourth Ward Park offers. There were 90 or so stands in total, but many of them were t-shirt vendors and DUI lawyers with food stands interspersed, all crowding the main path. There was plenty of open space where some sat down for picnics, but there was minimal table space for people holding both food and a drink. General admission granted one food and one drink. With 100 different food options to choose from, aiming for a variety or even a single meal would cost additional money. On the other hand, with only three non-beer drink options, there was not much variety to choose from. There was, however, a decent selection of beer to choose from.